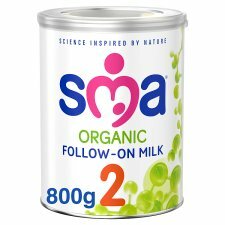 SMA® Organic Follow-on Milk is tailored for babies from 6 months as part of a varied weaning diet. At 6 months your baby's development progresses quickly and their need for iron increases. SMA® Organic Follow-on Milk is enriched with iron to help support normal cognitive development in baby's brain. It contains a blend of vitamins, including A, C & D to help support the normal function of baby's immune system, and is enriched with Omega 3 & 6† and iodine to help support normal growth. Iron to help support normal cognitive development in baby's brain. Vitamin A, C & D to help support the normal function of baby's immune system. Vitamin D and calcium to support the normal growth and development of bones. Omega 3 & 6† to help support normal development and growth. Moving to the next stage? From 12 months your baby will go through an amazing period of growth and development and their nutritional needs will change. SMA® Organic Growing Up Milk is nutritionally enriched to help support children's healthy growth up until their 4th birthday. It contains vitamin D and calcium to support the normal growth and development of bones, and Omega 3 & 6† and iodine to help support normal growth. It also contains a blend of vitamins, including A, C & D to help support the normal function of a child's immune system. Our expert team at SMA® Nutrition is dedicated to understanding the complex structure of breast milk and to applying the learnings from nature to our own products. We have been leading baby nutrition research for over 100 years and have now produced SMA® Organic Follow-on Milk, expertly developed with nature in mind to help support babies' unique nutritional needs. SMA® Organic Milk is sourced from certified organic farms, and meets strict EU Organic requirements. The cows that produce our high quality organic milk spend time outside where they can graze on green pastures and are fed organic feed. IMPORTANT NOTICE: Breast milk is best for babies and breastfeeding should continue for as long as possible. SMA® Organic Follow-on Milk is only suitable for babies over 6 months as part of a mixed diet. It should not be used as a substitute for breast milk during the first 6 months. The decision to start weaning or to use this product before 6 months, should be made only on the advice of a doctor, midwife, health visitor, public health nurse, dietitian or pharmacist, based on baby's individual needs. When bottle-feeding, do not allow prolonged or frequent contact of milk feeds with teeth as this increases the risk of tooth decay. Ask your healthcare professional or dentist for advice. Never leave your baby alone during feeding as there is a risk they might choke. All babies are different but try to ensure that from 6 months to 1 year your baby has 500-600 ml of SMA® Organic Follow-on Milk per day, either as a drink, or on cereals or mixed with food. Mix 1 scoop of powder to 30 ml (approx. 1 fl. oz) of water. Approx. 177 scoops per can. 1 scoop = 4.5 g. Approx. 29 x 200 ml servings per can. Whilst this product is made under strict hygienic conditions, it is not sterile. Failure to follow instructions on preparation and storage may make your baby ill.
1 Pull the safety seal and open the lid. The scoop is provided under the lid. Lift the tab, pull on the foil seal, carefully and safely remove the seal and dispose of it. 2 Wash hands well. Wash and sterilise all utensils according to manufacturers' instructions. 3 Boil 1 litre of fresh tap water. Allow boiled water to cool for no more than 30 minutes. Measure 180 ml (approx. 6 fl. oz.) of water into a beaker or bottle, carefully - the water is hot. Do not use artificially softened or repeatedly boiled water. 4 Using only the scoop provided, add 6 scoops of powder, levelling off each scoop with the back of a clean dry knife. Store the scoop in suspension inside the can and replace lid. 5 Place a lid on the beaker, or teat and cap on the bottle and shake well until powder is fully dissolved. Cool beaker / bottle under cold running water or in a bowl or jug of cold water until lukewarm, do not immerse the lid/teat. Test temperature by shaking a few drops onto the inside of your wrist. Do not add extra powder or water to make the feeds stronger or weaker and do not press powder into scoop. Using too much or too little powder can make your baby ill.
We recommend preparing each feed in individual beaker /bottles when required. For hygienic reasons, discard unfinished feed in the beaker/bottle as soon as possible. Made-up formulae can be poured over cereals and mixed with food. Do not alter or add to formulae unless medically directed. Do not warm feeds in a microwave, hot spots may occur and cause scalding. Remember, cows' milk should not be used as a drink during the first year. Guarantee: This product should reach you in perfect condition. If it does not please call us and we will be happy to investigate this for you. We will need some details, so please do not dispose of the pack or its contents. This guarantee does not affect your statutory rights. Use within 4 weeks of opening. For best before, see base of can.